Asteroid (1910) Mikhailov will occult TYC 5693-00333-1 on 2013 July 11 from 7:26 UT to 7:38 UT. Local times will vary. The star has a reported magnitude of 11.1. 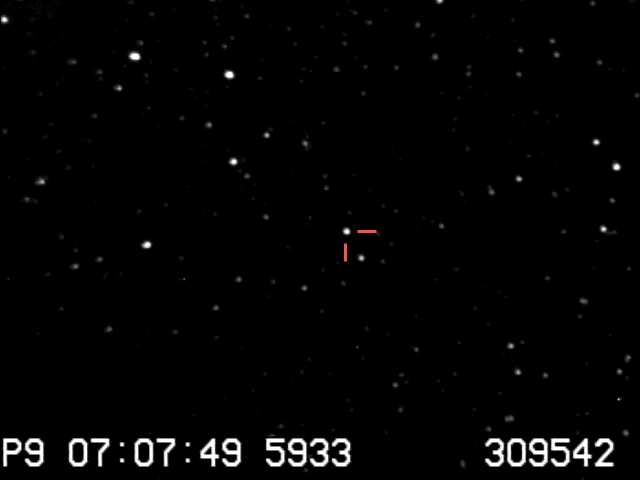 The star’s position is RA 18:51:07.5, Dec: -07:37:51, J2000. While all RECON teams are invited to participate, we are primarily looking to obtain data from CENTRAL REGION of the RECON network, specifically Burney-Fall River, Susanville, Greenville, Quincy, Portola, Reno, Carson City, and Yerington. This is based upon the predicted path and uncertainties associated with this asteroid event. The maximum duration is 2.9 seconds. All RECON sites should start recording at 07:29:00 and run until 07:33:00 (four minutes total). Please use a sense-up of x16. The waxing crescent moon (9% lit, 139 degrees away) will be below the horizon during the event. The image below shows the Mikhailov star field at a sense-up of x128. The image was taken using a C-11 on an equatorial mount, so unfortunately the orientation will not match that of the CPC-11 alt-az mount. We will update this file shortly with an alt-az orientation. The target star is highlighted using red tick marks. 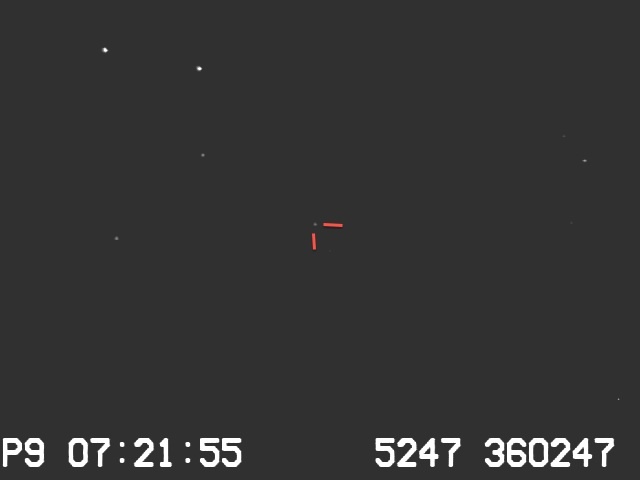 Here is the same field taken at x64 and stretched to show the target star. I’ll be observing this event from my observatory ~5 miles SE of Greenville. Going to be observing at the Bateson observatory here in Susanville.